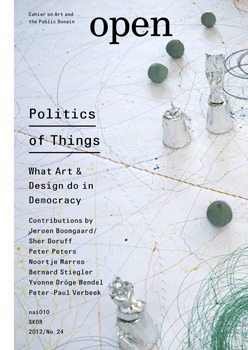 In 2005, in the book and the exhibition Making Things Public: Atmospheres of Democracy (see here), Bruno Latour and Peter Weibel asked themselves how democratic politics could function better and what the role of things, objects, issues and art might be within that. Open24 investigates the current state of affairs in the theory and practice of the ‘Politics of Things’. What does a thing like ‘art’ do in democracy, how does art make publics, how does a thing interact with other things and people, and how does it influence them? Jeroen Boomgaard shows how the politics of things offers purchase for actual practice, while Sher Doruff urges more abstract and philosophical reflections. Peter-Paul Verbeek demonstrates how art can examine the political role of things. Noortje Marres uses the example of the teapot to analyse the political role of technology, things and issues. Bernard Stiegler philosophizes on the technical condition under hyper-capitalism. His essay is introduced by Pieter Lemmens. Pascal Gielen proposes that the ‘Art Thing’ can encourage a democratic autonomy. Peter Peters and Ruth Benschop reconsider the public work of art Tilted Arc by Richard Serra. Fiona Candlin investigates the public significance of the Vintage Wireless Museum in London. Mariska van den Berg examines how the relation between citizens and the government can be reinterpreted by art. Plus, a visual contribution by Yvonne Dröge Wendel and her Object Research Lab, with a dialogue by Sher Doruff and Maartje Hoogsteyns.